Instagram: the social media site that is both the best and worst thing ever for photographers. It makes perfect sense for photographers to use Instagram. I mean, it's a photography platform! However, since everyone has a camera (whether it's a DSLR or a phone or a point and shoot or a vintage film camera), everyone is now a photographer and Instagram has become a place where professional photographers can find themselves struggling to stand out. As a moderator and curator on three different Instagram accounts, I have had plenty of experience in the Instagram world. I've experimented with many different techniques, hopped on many different webinars, implemented many different tips, and lost many hours of sleep (not really) in an attempt to build up my Instagram accounts. Over the past several months, I have tried different techniques on each of my Instagram accounts. Here is some data for you from each of my Instagram accounts. 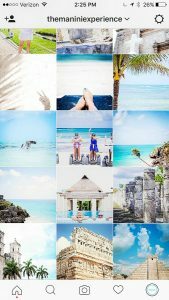 By watching the growth (or lack thereof) of each of my accounts, I now have a good idea of the best techniques to use to grow your Instagram. So, here I share with you my best Instagram tips for photographers (in no particular order). 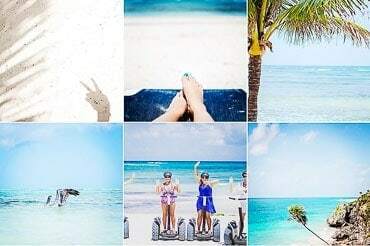 Figuring out what to post can be one of the biggest challenges photographers face when thinking about the curation of their Instagram profiles. It seems there is a constant battle between personal and professional, cell phone pics and DSLR photos. 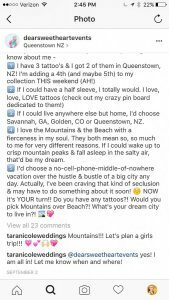 It's definitely hard to decide which direction to follow, especially if you're hoping to only have one Instagram to moderate. In comparing my three accounts, there is a disparity in the ratio of personal/professional and cell phone/DSLR images. The Manini Experience Instagram is 100% professional, 99% DSLR (1% GoPro). All of the photos are representative of my business, which is a travel company that involves cool locations and great photos. Everything on this profile is travel related and taken with a professional level camera. However, although the photos are professional, we make the posts personal in the text we use. 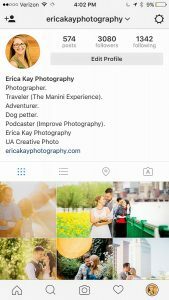 Erica Kay Photography Instagram is primarily professional and DSLR images with a sprinkle of personal images, cell phone shots, and advertisements. 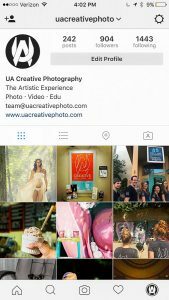 UA Creative Instagram is a mix of DSLR and cell phone images and advertisements, all of which are related to our company's shenanigans. It seems here that the most appealing profile is one that is primarily professional, with good quality photos, and a bit of personal(ity) sprinkled in through text and a random high-quality personal image. That being said, I think one of the most important things you can do on social media is be genuine and personal, so I encourage you to keep implementing bits and pieces of your life into your photography Instagram. 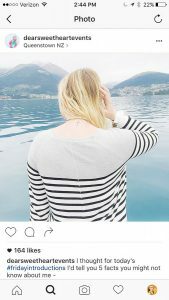 One thing that really attracts an Instagram crowd is the look of your profile. 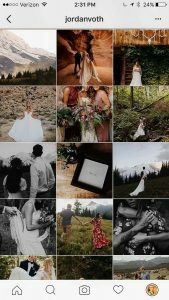 When someone goes to your page and scrolls through the thumbnails of your images, what do they see? Is there a common theme, in both content and look? Do the images flow well, or are they sporadic in their placement? It's so important to keep your images consistent in style, appearance, and flow. This is what encourages people to click the “Follow” button more than anything. @jordanvoth has consistent editing, styling, and theme. Later, an app that lets you plan out your Instagram posts, has been so wonderful in curating the Instagram account for The Manini Experience. Once or twice a month, I sit down and schedule out my posts for the upcoming weeks. I schedule them in a way that allows for a smooth transition from one photo to the next, therefore resulting in an organic flow throughout the profile. Not only does Later allow you to see your photos all laid out as they will appear on your feed, but they also allow you to include your descriptions/texts when scheduling posts, so that you just have to paste in the text and hashtags when posting to Instagram. It has made my Insta life 100% better. Another tricky question, and one that has many different answers. Although Instagram has recently implemented a new algorithm that shows images based on popularity rather than chronologically, it's still important to consider the time of day when posting. You should consider two aspects of your fan base: where are the majority located and what type of people are they. Both of these things will determine what time is the best time for you to post. In my personal experience, posting around 7:00 am EST is best for me because many of my followers are located on the East coast and many of them work “normal” 9:00-5:00 jobs, which means they're looking at Instagram around 7:30 am before getting ready for work. Is your fan base full of late night party goers? Then maybe 9:00 pm is best for you. Are your followers based in Europe? Make sure you're scheduling your posts based on their time zone. 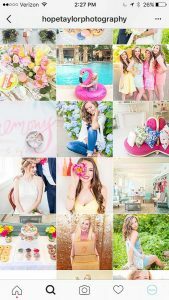 @hopetaylorphotography has the perfect timeline for her posts. There is a sweet spot in between too many posts and not enough posts. If you swing too far in either direction, you will definitely lose followers. I recommend posting an average of 1 image per day for best results. This allows people to see you every day, but is not too invasive to the point where people are sick and tired of seeing your name on their Instagram feeds. Duh! Remember the golden rule here – do unto others as you wish others to do unto you. Basically, follow people if you want people to follow you. One of my favorite things to do is to go to accounts I like and look through their followers. I then follow any whose profile is interesting or beautiful or inspiring. I'll also go through and like a handful of images and leave them a few comments. Spreading love is the best way to get yourself noticed. Many Instagram “teachers” encourage people to go to accounts that have similar interests and simply follow every person who follows that account. Successful? Yes. Organic? Not so much. You may have heard of the recent follow/unfollow craze. This is when people follow people (usually mass amounts at a time) just to unfollow them immediately after they receive a follow back. In my opinion, this is annoying, rude, and tacky. Although it may gain you followers through the follow back concept, it'll also make you look like an —hole when they realize you've done that. How do they know, you ask? Through apps like Crowdfire, which tells you who follows you, unfollows you, doesn't follow you, etc. I actually highly recommend this app in order to track your follows, likes, and engagement statistics. 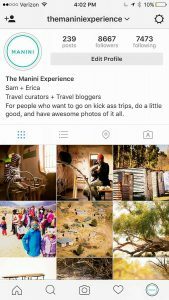 I mentioned earlier that although my photos on The Manini Experience Instagram are all professional and travel related. Despite this, I'm able to engage followers with my posts by using engaging text and descriptions. Check out the suggestions below for ways in which you can increase your post engagement through your text and descriptions. Tell a story. Give the background of the photo, describe the scene, share its importance. Tell us about the photo in as much detail as possible. Ask a question. This the best way to ensure people comment on your posts. Ask for advice. Traveling to a new area, need ideas for new recipes, need some basic life advice? Just ask and watch the engagement for that post grow! Talk about yourself. Introduce yourself, give us some fun facts, tell us a little secret. Let your followers into your life so that they know you're a real, interesting human being. @dearsweetheartevents is the master at engaging her followers. No matter what you do to engage followers, always make sure you reply back to every comment left on your post. Always answer questions, make follow up statements, or simply say thank you. Not only does Instagram take that into consideration in their algorithms, but you'll also just look like a decent person. Another way to increase your followers and engagement is to actually be social on your social media. Make sure you like and comment on other people's posts. Perhaps even share posts that stand out to you for some reason. Spread those wings and be a little social (media) butterfly! Soooooo many people roll their eyes at the idea of hashtags. I get it. They can be obnoxious. However, like it or not, they're super important to growing your followers and engagement. Take some time to do some research in order to find the best hashtags for you. Be sure to use hashtags that are relevant to your posts, that are popular, and that are going to be seen. Also, be sure to use the max amount of hashtags (30) as often as possible. The more your work spreads, the better your chances of gaining new followers. 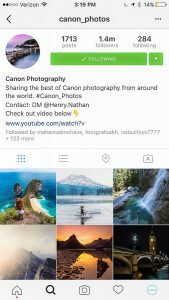 Another suggestion is to use the hashtags of large Instagram profiles who share the work of other photographers. There are tons of profiles out there who have custom hashtags just so that they can share the work of those who post using their hashtag. Getting yourself featured on a large account will likely earn you a ton of new followers in a very short amount of time. Use hashtags of large profiles to have your work shared! Another way to increase your followers and engagement is to participate in Instagram support groups. There are Instagram engagement groups ALL OVER Facebook, all with the goal of creating smaller support groups based on common Instagram themes. Within these groups are people who support each other by following, sharing, commenting, liking, and engaging with each other on Instagram. While this isn't necessarily an organic and business-oriented way to increase followers, it does help with upping your numbers, which in turns helps with credibility and good impressions. Let's take a deeper look at the data from my Instagram “experiment” and see how each of the tips I mentioned affected my growth and engagement. Descriptions are generic for the content specific posts. Typically only use the personal content to show the personal side of the account. As you can see here, following the tips listed above will result in greater engagement, more followers, and a better Instagram experience. I can't wait to hear how these additions to your Instagram workflow improve your Instagram!